Our second annual Extreme NOW World Tour is back and we’re coming to a city near you – it’s bigger and better than ever! Join us for our worldwide roadshow, offered via a full-day NOW Forum or a half-day NOW Exchange event. 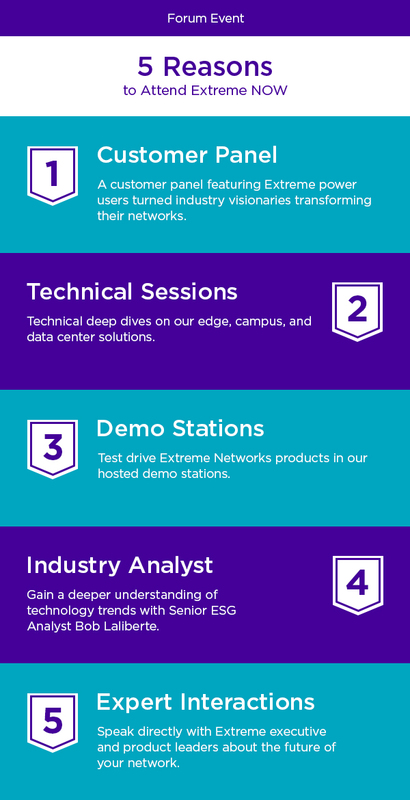 Either way, you’ll get an exclusive glimpse into what’s new at Extreme, including where we’re headed and how your organization can most optimally use Extreme’s growing product portfolio. Both executives and product strategy teams will be there to answer your questions, have one-on-one meetings, and talk through the information that’s most relevant to your network environment and business needs. (FYI: agendas differ from location to location. Check out the Extreme NOW registration site for precise details). All around the world! You can find us in cities throughout the U.S., Canada, Europe, Australia, Asia, and Latin America. Check out the full list of events with cities and dates here! This roadshow is global and multi-city, so we’ll be kicking off in November 2018 and wrapping up in April 2019, right before our global user conference, Extreme Connect. 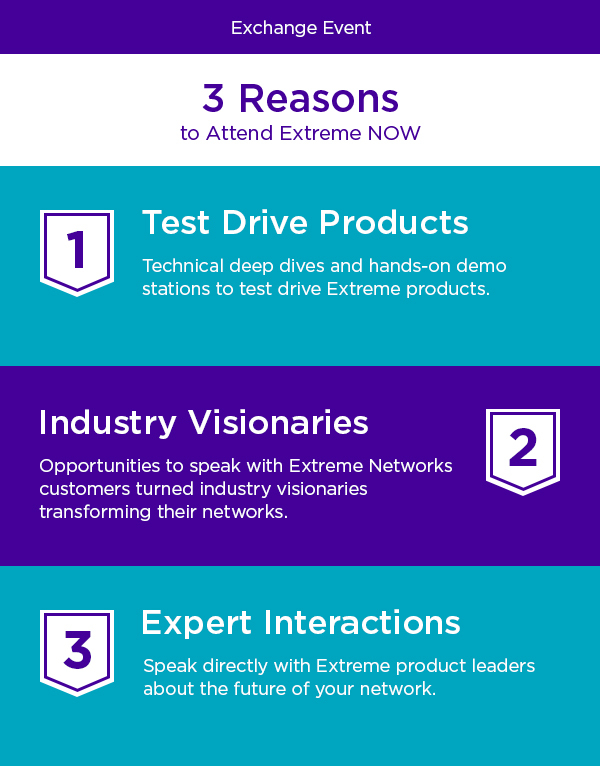 As an added benefit to attending Extreme NOW, you’ll get preferred pricing for Extreme Connect 2019! Forum events are full-day, starting with presentations by Extreme Executives, industry analysts, and key Extreme customers, followed by an afternoon of technical breakouts, meeting opportunities, networking, and live demonstrations. Exchange events are half- to three-quarter-day events, with presentations by local leaders and key Extreme customers, followed by an afternoon of hosted technical breakouts, networking, and live demonstrations. What’s in the Content and Presentations? Extreme roadmap: see how our evolving technologies will come together! The NOW World Tour is focused on making in-person connections with our network of current and future customers and partners. It’s an excellent, complimentary event for longtime customers, anyone who’s currently exploring our ecosystem of agile, adaptive and secure networking solutions, and those of you who are on a quest to evaluate potential networking products to meet your evolving needs. You’re sure to find applicable content, tips and tricks, and make new connections. Nope! Extreme NOW is totally complimentary. All you need to do is register for an event in your area.